This top can be found in archeological discoveries, paintings and drawings, and boys' activity books for the nineteenth century. The top does take a bit of practice to toss. The simplest directions I have found (these are for soneone right-handed) is to hold the string with the right hand while holding the top in the left hand with the bottom spindle pointing toward the right. The string is overlapped slightly and then wound with the string going clockwise if you viewed the top from the bottom. The top is then held upside down (with the top in the palm of your hand, the axis would be parallel to your knuckles and the spindle point would be next to your thumb). 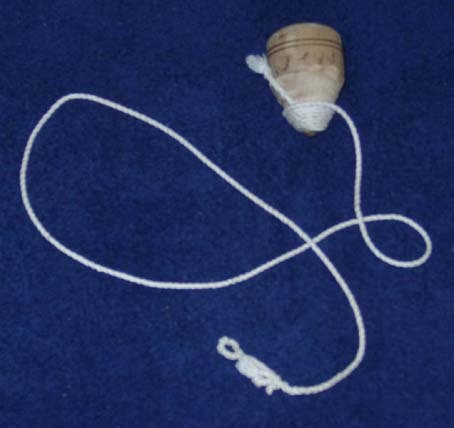 The casting of the top consists of a sweeping sidearm motion with the string yanked toward the thrower after the top is released. For a left-handed person, the string would be wound counter-clockwise. The cost of a Peg Top is $4.85.